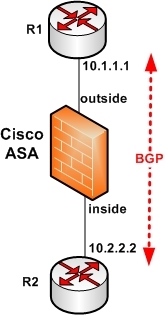 The following article describes the proper way to allow BGP sessions between two routers to pass through a Cisco ASA firewall appliance. Especially if the BGP configuration between the two routers uses MD5 authentication (which is a good security practice), you need some special “treatment” on this session in order to pass it successfully through an ASA device. By default, the Cisco ASA does TCP Sequence Number Randomization to every session passing through it. Also, the ASA will strip TCP option 19 by default. This TCP option (defined by RFC 2385) is a TCP extension to enhance security for BGP when using MD5 authentication. The two actions above will cause problems to a BGP session when passing through the ASA and therefore we need to disable them. From diagram above, first we need to match the BGP traffic between R1 and R2 using an Access Control List. Then we must create a TCP Map that allows TCP Option 19 and also disable the TCP Sequence Number Randomization for this specific BGP traffic class. Allow TCP option 19 with a TCP Map. Create a class map to match the BGP Traffic using the ACL above.